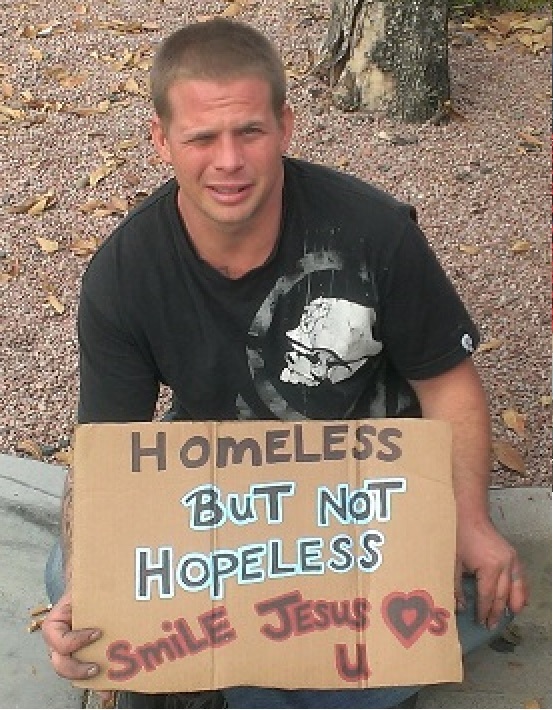 This homeless man put great heart into designing his sign. I am a sucker for a homeless person. But one with a nice sign, forget it. Hit the brakes! Weary after my four hour drive from Las Vegas, I had two minutes left to arrive at my home. You may wonder if I had any money left after visiting Vegas? Sure I did. My gambling amounts to about $5 per trip! It’s wild, I know. Donations to homeless folks actually dwarf my gambling expenditure. I guess I feel there is a better return on that money, at least one I can see. I stopped my car with traffic behind me, jumped out and give him a dollar. Yeah, the sign was nice, but also noticed this young guy smiled, he was polite and he was well spoken. He was strong with a good handshake, I was impressed. As I was driving home, I thought I should have taken a picture of his sign! I appreciated his heart and design in that sign. And that was some quality penmanship! So, I was now about 100 yards from home. Instead of pulling into the homestead, I turned the car around. I had to get that picture. Arriving this time my car was parked in a safer spot. I hopped out of the car asking him if I could take a picture of that sign. I put another dollar into his cart, the big spender that I am. We talked for several minutes. I found out that he just lost his job because the company closed laying off thirty people. His family helped for two months but could not anymore. He thought maybe I had seen him around over the years because he and his dad were homeless for nearly three years living in that area. That homeless spell came to an end after he went to jail on a felony. His dad wasn’t around anymore, but he did find the Heavenly Father. While he was in jail he found God. He feels safety in his faith, a confidence, which makes him comfortable every day. He feels he’ll be taken care of. Other donations came. While we talked, a young girl scurried over handing him a Five Dollar Bill. Hold the phone. She dwarfed my donation! But it’s all good. That, too, made me smile – especially because he thought the girl was cute. His situation is not hopeless, at all. Yes, there is hope. I think he’ll be taken care of.